← Curious about the news in the latest version of op5 Monitor? 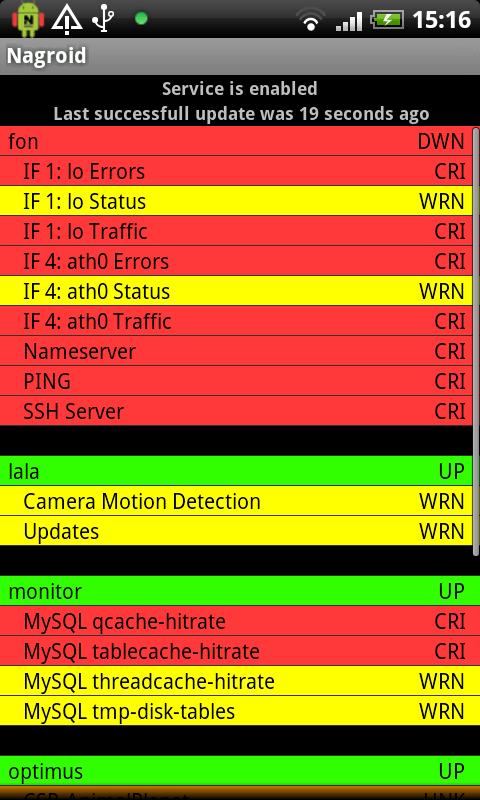 Nagroid, available from Android Market is developed for Nagios but works just fine for op5 Monitor. Nagroid is very basic in its features, you can view the warnings/alarms to see the status on your checks, and thats it… Oh, and there is a direct link so that you can browse to your system. Nagroid is usefull and free but very basic. You will find a short guide for the configuration of Nagroid for op5 Monitor here, thank you IT-slaven for the guide! The iPhone app Touchmon also work with iPod Touch and has come further than Nagroid when it comes to look and feel, with a more modern and user friendly interface, but also when it comes to what you can use the app for. With Touchmon you can Monitor your system health, acknowledge problems and set downtimes!